Is it a pizza slice? Or is it 1/4 of a pizza? Pretty much both…. and it only costs $2.36! 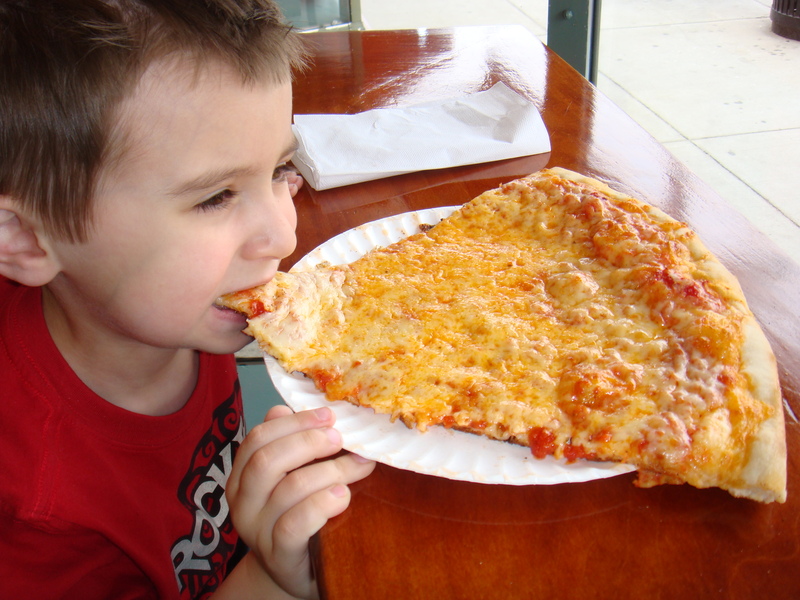 This is the size of a slice at the Real Deal Deli in West Roxbury — and this wasn’t a fluke… this is a standard-sized slice of pizza from the Real Deal — which happens to be one of our favorite take-out places. Real Deal currently has two locations… one on Centre Street in West Roxbury and one on Centre Street in Jamaica Plain. The latter delivers… but the former is attached to Sugar Bakery — owned by the same family. I’ve written about both of these places a few times… so I won’t go on and on. That said, I WILL tell you that if you didn’t already know — you can order online from either location and your order will be ready for pick up. Click hereto order from the W. Rox location or here to order from the JP location. FYI — they do not list individual slices of pizza on their menu… but you CAN order it by the slice. If they have it, they will save the slice for you. If they don’t have it, you are S.O.L. Not only is their pizza delicious… their sandwiches are amazing too. In fact, the won the Phoenix’s Best of Boston “Best Sandwich 2009” award. My personal favorite? The Sicilian — fresh mozzarella, Roma tomatoes, fresh basil, oregano, olive oil and a balsamic glaze ($5.99) — like you couldn’t have guessed this! And the take-away of this short post? If you are doing Weight Watchers and you see that a slice of pizza only contains 6 points… that DOES NOT mean a slice of pizza from the Real Deal in West Roxbury or JP. Got it??? BUT… if you are hungry and want great pizza or a fabulous sandwich… this is the place for you!